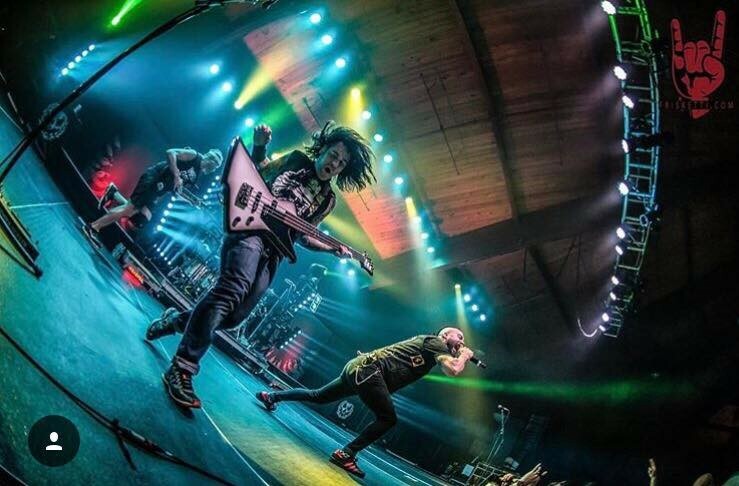 NEW YORK -– It was a happy union for metal fans when Killswitch Engage and Anthrax, two of the genre’s most influential bands, announced earlier this year that they would be joining forces on the Killthrax Tour. The 34-city tour, which concluded in May, more than lived up to its advance billing, serving up heaping helpings of KSE’s signature metalcore sound with its heavy guitar riffs and Anthrax’s compatible, but distinctly different, thrash brand of metal music. Helping to set off the KSE section of the dual concert was a fast-paced multi-dimensional and richly colored lightshow anchored by CHAUVET Professional Rogue R1 FX-B and Rogue RH1 Hybrid moving lights supplied by JDI Productions. Josh Mihlek, KSE’s production manager, designed the rig with the JDI Productions team. “The idea behind our show was to use a lot of color and big looks but at the same time position the beams of the FX-Bs in a way that they almost wrapped around the band members,” he said. “The RH1 Hybrids were used for aerial and crowd looks and for top lighting the band in colors. KSE has a very emotional sound and our colorful lighting supported that. Therrien and his fellow JDI Productions lighting designer Cody James, who replaced him near the end of the tour, positioned most of their fixtures on four towers that ran across the back of the stage. The two towers at the edge of the configuration were five feet high, while the two in the center were seven feet. A single Rogue FX-B was front hung on each five foot tower, which was topped off with a Rogue RH1 Hybrid. The two seven foot towers had two FX-Bs front hung and a RH1 on top. An additional three FX-Bs were positioned on an eight foot truss that ran horizontally behind the drum kit. For atmospherics, their design relied on two Vesuvio RGBA foggers and two CHAUVET DJ Geysers.